Thou shalt invest in After-Care Products: To keep your tan fresh and glowing for as long as possible you need to look after it. Spend some time moisturising yourself every day using TechnoTan Body Butter, Full Body Moisturiser or Moisturising Body Milk. 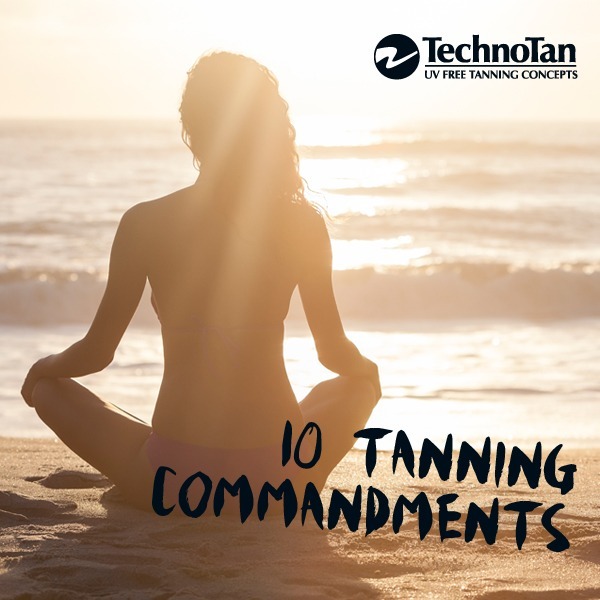 Stop your tan from washing away by using TechnoTan Tan Saver Body Wash which is Sodium Lauryl Sulphate Free and contains no harsh chemicals that will strip the skin of its colour unlike many body washes on the market. Similarly TechnoTan Tan Saver Shampoo and Conditioner are perfect to protect the colour of a Spray on Tan whilst cleaning and nourishing the hair.The Hair Care range is Sodium Lauryl Sulphate free and formulated using natural and organic ingredients designed so the runoff from washing hair will not affect the colour of a Spray Tan unlike many hair care products on the market.